I wrote about losing one of my favorite "news" apps and how that's changed my habits. I used this as an opportunity to up-end my entire reading process as an experiment in knowledge acquisition. This has mostly been a success and a surprise. The first surprise was Wikipedia and related community driven repositories. On iOS, there is no shortage of Wikipedia apps. As it turned out, I've owned one of the best for the past 5 years. Wikipanion Pro is my preferred app but I'll mention some solid alternatives. First, some description of how I use Wikipedia. The best Wikipedia apps have a "random" option that immediately drops you into some arbitrary Wikipedia article. This has been more fun and informative than I thought. I generally prefer this to reading news. It takes me back to my childhood of opening a volume of Enycolopedia Britanica and reading from the top of the page. Or flipping through a volume looking for the best pictures. There are times when I just want to sit and research a topic. There are two ways that may favorite Wikipedia apps help me dig deep. Most support a simple index option where I can see an outline of the major topics in an article. For example, the Wikipedia app does this beautifully and the reading experience is very nice. If I'm particularly interested in exploring, then I really prefer a wiki-web viewer such as WikiLinks or WikiWeb. Both apps show the connections between articles but also provide a quick way to expand the depth of the connections without having to open each article. It's not quite a random exploration but it does provide a quick way to harvest a variety of article topics for reading. With that settled, here's a few apps I really like for exploring Wikipedia and related sources. WikiLinks has a very convenient method to quickly traverse a topic and bookmark articles I'm interested in. Tap one icon and WikiLinks automatically retrieves the next level of related articles as part of the current web. It also has an extremely convenient function for caching all related articles for reading offline. This is particularly great when traveling. The reading mode in WikiLinks is very nice. The detail article view provides quick navigation to just view media by type and search the article for text. I also really like the quick popover to browse the article while still in the node view. The reading experience is very pleasant owing partially to the availability of a dark theme. There's an extensive list of themes that range from pleasant to comical. I really do prefer the dark mode though. The reading experience in WikiLinks is easily tweaked beyond a simple theme using controls for font face (including San Francisco), size, and hyphenation. WikiLinks also provides a really nice option to open any Wikipedia link from Safari for iOS right into the app. It's a nice touch. The bookmark export in WikiLinks is just perfectly nerdy. The entire list can be copied to the clipboard as text which includes the article title and URL. This is so perfectly "me", that's it's actually a little creepy. I love it. One last bonus in WikiLinks is the quick access to search in Wiktionary. Strangely this isn't accessible by selecting a word in the article viewer which is where I'd really want it. Still, it's a nice option and search in the Wiktionary source doesn't effect the current wiki web view. Wikiweb is also a nice little app for exploring the vast Wikipedia milieu. I like flat colors in the node view of Wikiweb much better than distracting icons of WikiLinks. Tapping a topic immediately expands the links in the web and the UI mostly gets out of my way. It's not as feature rich as WikiLinks but it's a very nice alternative, depending on your taste. As I mentioned previously, the official iOS app for Wikipedia is actually quite good. It does almost everything the average person could want. The app provides a terrific reading experience and the outline view is great for quick navigation. As with most Wikipedia apps, it is a bit too much effort to hop to a random page but at least it loads fast. One of the best features of the official access is quick access to the "Today" page where curated and newsworthy articles are linked. It actually makes for a fairly good start to a reading day. Marking an article as a favorite makes it available offline and the entire "Saved pages" list can be refreshed with a single tap. Sharing a Wikipedia article is also quite nice, with the option to share as a standard URL or to generate an image of the selected text and the URL. Surprisingly, the official app also allows article editing right from iOS. It's more limited that using a full desktop browser but edit buttons populate the article reader view (which is a bit ugly and distracting to me). I include Wikiwand here because of its design, not its features. It's one of the prettiest Wikipedia apps I've used. I love the vibrant colors, the pop-out article outline and the in-article search. It's just a really nice looking app, but nothing terribly special. On the other hand, Wikiwand for the desktop browser is much nicer than just using Wikipedia directly. The biggest downside is that it requires a Facebook login to bookmark articles (which seems crazy). Here we are at the last app and I saved the best for last. Wikipanion will blow your doors off with features and it makes me long for it when I'm on my Mac. Let's start with the best feature: support for many more wikis than Wikipedia. Wikipanion provides access to hundreds of niche topic wikis. Everything from Adventure Time to Wookieepedia. My list has continued to grow over the many years I've used the app. I think my list just about sells the app but I still have a long list of terrific features to cover. Adding a new wiki is accomplished by browsing or searching the extensive built in library. Tap the "add" button and you're all set. If you have a wiki that's not currently included, you can either request it to be added, or add it manually to your own list. What does this get you? Well, first off, it's such a joy to select the Simpson's Wiki and randomly start reading an article. Or how about the Star Wars wiki or the Adventure Time wiki? It's all so chock-full of great stuff and I've spent many hours enjoying the minutia of fandom. Of course, I could just do this all through the web, but having it all in one app with a nice UI is better. But where Wikipanion Plus really nails it is with the bookmarking and reading queue and it's totally worth the entry fee. As I browse articles, I tap links and those articles are added to my reading list, regardless of which wiki I'm in. As I read articles in my list, they are automatically removed. In contrast, bookmarks stick around until I manually delete them. I can also choose to download the bookmarks to make them all available for offline reading or even organize them into folders. 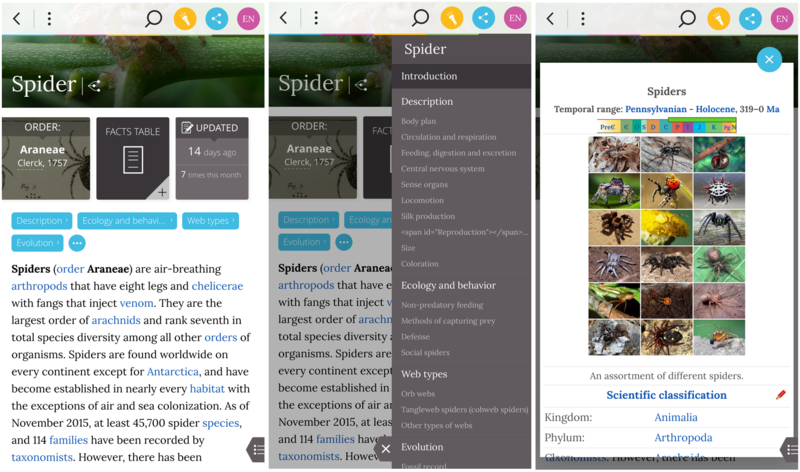 Wikipanion Plus adds iOS syncing for both reading queue and bookmarks so you can build up articles on your phone and leisurely read them on your iPad. The other advantage of using Wikipanion over a web browser is that Wikipanion keeps track of my entire history across multiple wiki sources, which is actually a pretty important feature for anyone that surfs randomly. The other way that Wikipanion keep me busy reading is through the related article list. This is the gateway to many rat-hole explorations. I spend far less time reading the same news articles over and over and a lot more time exploring the things I like. I also now spend a lot more time finding new things I like. While several of these Wikipedia apps are moderately priced, I think they are totally worth it for what I get. The 10 year old version of me would have given up the prime seat next to the Encyclopedia Britannicas in a second for 30 minutes with Wikipanion Plus.